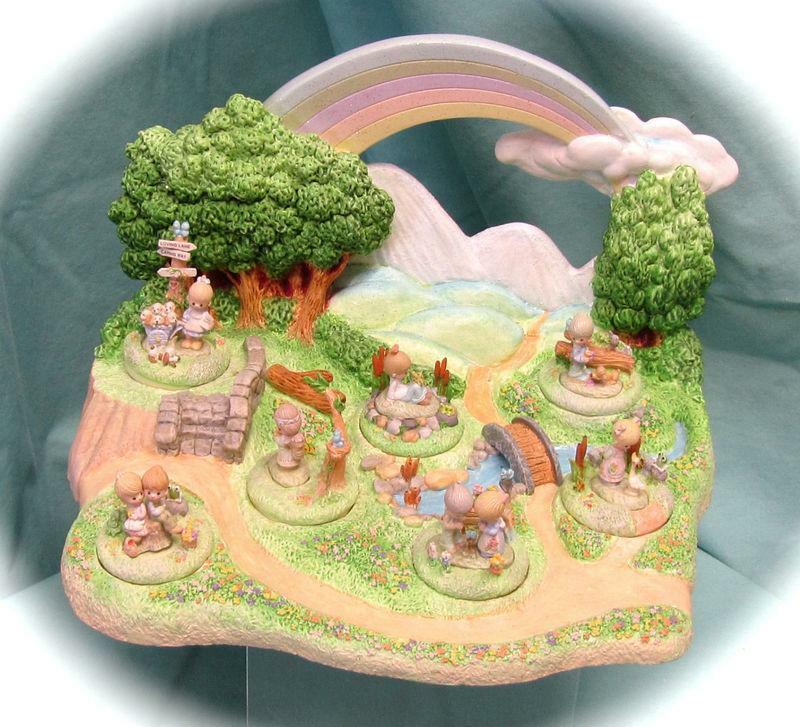 Featuring the 1995 "Field of Friendship"
First Issue Precious Moments Miniature Figurine set. meticulously hand painted by skilled artisans. It features the Diorama display and all 7 miniatures figurines. Diorama Retailed for $135 and Figures for $70 each = $625. #768-D : Diorama display . . . 8"x7"x6"
piece very carefully for you. Check out our other quality items in our store. We carry many vintage & collectible items. We do not clean, restore or repair. This prevents damage & helps retain it's value. Cleaning & repair is the choice of the buyer. We photo all of our own actual items.Color may slightly vary due to lighting. We try to describe each item as honestly & accurately as possible. It has been displayed in a smoke free-climate controlled location. We take special care to pack your purchase for safe shipping. We always work to satisfy our customers 100%. Feel free to contact us prior to your purchase. I have traded in quality items & collectibles since 1997. We accept Paypal confirmed orders ONLY. Please e-mail us prior to purchase with your city, country,and zip code for shipping quotes. Import duties, taxes & custom charges are not included in price or shipping costs, and are the responsibility of the buyer. Please check with your custom's office to determine additional cost. within 2-3 business days of cleared payment. Local pick-up available by appointment. Our special offer $500.00 Please look at all my pictures for details and feel free to email me at floydruggles@weststpaulantiques.com with any questions. Estimated Packed weight: 4 lbs 2 oz. Shipping Options: Shipping Charges or pick up for Free.